Tours take place on Saturdays at 9am. Limited Space Available. 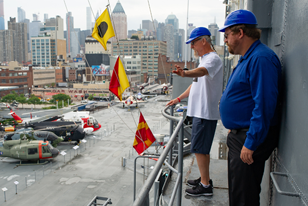 call 646.381.5065 or email tourguide@intrepidmuseum.org to book this tour. No more than 10 guests can be accommodated on one tour. Tour run time is approximately two to three hours. Tour requires long periods of walking and standing. Minimum age requirement is 16, no exceptions. Tours are staffed by two senior tour guides. Guests will be given a semi-protective, branded bump cap to wear during the tour and to keep after as a souvenir. Refreshments will be provided prior to the beginning of the tour and during a small break. 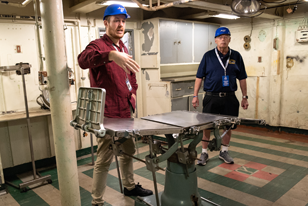 Guests must be able to navigate under shallow clearings, the lowest being 39 inches/99 centimeters in height and up and down steep angled Navy ladders and through ship’s hatches. Photography of any kind is prohibited on the tour. Museum staff will take a photo of the group at the end of the tour that will be distributed to all guests. This tour requires extensive walking as well as navigating steep staircases, so guests must wear comfortable rubber soled shoes. Open toed and/or high heeled footwear are prohibited. Loose clothing items and personal accessories that may limit guests’ maneuverability or expose them to hazard will be banned from the tour route. Cell phones and photography are prohibited on the tour. Guests may leave such items in the secure briefing room for the duration of the tour. Such items include: handbags (large and small), backpacks, luggage, scarves, dresses, hooded clothing, loose outerwear and certain jewelry. 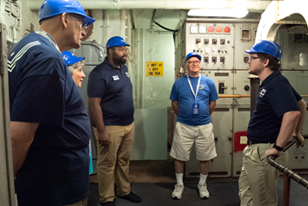 Secure lock boxes and spaces in the briefing room will be available for storage of cell phones and other small items that are prohibited on the tour route.